If your childhood was in the 90s or early 2000s you probably still remember classic games like Pong, Tetris, Pac-Man and Super Mario, and we bet that you’d recognize the signature tunes that each of these games came with. Good news is that a lot of these games are available on mobile today, and you can enjoy playing them on an iPhone or an Android device. If you want a quick refresh, though, YouTube user FamilyJules7X has just what you need: a 17-minute video that will walk you through the history of video games - from those earliest titles to the latest ones, including games that are now very popular on mobile like Super Hexagon for the iPhone (and later, Android), the Sonic series, Mortal Kombat, the Sims, and more. 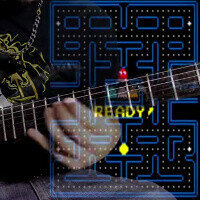 The video remix is all about music from those classic titles, but not in its original form - instead, it’s all re-imagined as metal music. The 17-minute mix has covers of 38 games in total. It’s a true opus in itself, as FamilyJules7X plays not just the guitar, but also all the instruments: lead, rhythm, and bass guitar, drums. Moreover, he’s arrange, mixed, mastered and edit the whole thing in what had become a year and a half project. You can also check out individual covers of game songs on his channel, but this seems to be his most epic project so far. And DOOM...the best ever shooter game of it's period..
You can tell the Legend of Zelda series is special to this guy. A) by his shirt and B) he did 4 of the series games. I too am a LoZ fan, and salute this man for his effort.